Food manufacturers and restaurants are taking the dairy industry by the horns on an animal welfare issue that's long bothered activists but is little known to consumers: the painful removal of budding horn tissue from calves so farm workers or other animals don't get gored later. It's routine to remove the horn tissue from young calves before it attaches to the skull, either by burning it out with heat or chemicals or digging it out with sharp instruments. While veterinary groups recommend pain treatment, only about 10 percent of calves are properly medicated, according to Vermont dairy cattle breeder Mark Rodgers. Certain cows carry a dominant no-horn genetic trait, and are called polled cows. Research has shown it's cheaper to breed polled cattle than to dehorn cows, but experts say the dairy industry has been slow to expand polled genetics because it's been focused on boosting milk productivity. 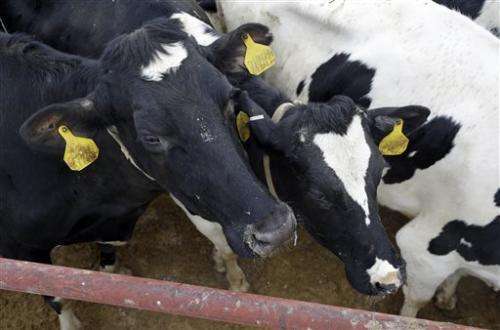 Yet, the change may come sooner than producers expected, as some of the nation's largest food companies, such as General Mills, Nestle and Dunkin' Brands, are asking dairy suppliers to incorporate polled cattle into their herds. The beef industry already has largely adopted polled cattle. Less than 1 percent of the nation's dairy herds carry the hornless polled gene, but 10 times more polled animals have been registered with breeding programs in the past three years, Rodgers said. "It's an animal well-being issue but it's also a management issue. It's a labor-saving issue. 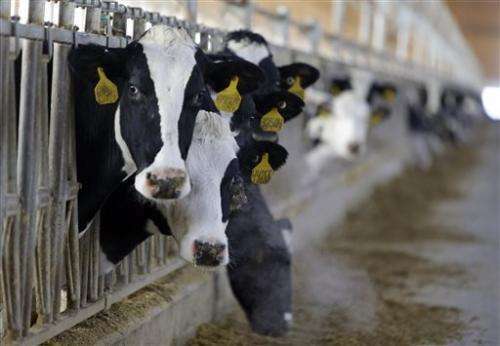 Ask anyone working on a dairy farm and they'll tell you the most disagreeable job on those farms is dehorning calves," said Rodgers, who belongs to an international group of 46 polled breeders, including farmers in Australia, Canada, England and Germany. U.S. Department of Agriculture and Purdue University research has shown it's more expensive for farms to dehorn cows than it is to use polled genetics, something Galen says there is "merit in exploring," but added, "it's a very limited gene pool in dairy breeds right now and that won't change for many years." The People for the Ethical Treatment of Animals, or PETA, began working with restaurants, food makers and dairy farms three years ago to push the use of polled genetics. David Byer, PETA's senior corporate liaison, said the public doesn't know what milk cows go through. Both companies' policies advocate the use of analgesics or anesthetics to reduce pain in disbudded calves. The animal welfare policy of Dunkin' Brands, which owns Baskin-Robbins ice cream, asks its suppliers to "support industry-wide efforts to promote the humane treatment of cattle, including the responsible use of polled breeding." And dining chain Denny's released a policy in February indicating a "purchase preference" for milk from polled dairy cattle. Grocery-chain suppliers increasingly are on board, too, such as Colorado-based Aurora Organic Dairy, which supplies Wal-Mart and Costco, and Trader Joe's supplier Rockview Farms. Fair Oaks Farms in Indiana, a Kroger supplier and one of the nation's largest dairy farms with 36,000 cows, is phasing out horned milk cows. About a quarter of its newborn calves are hornless due to selective use of bulls with the polled gene, CEO Gary Corbett said. It began to do so after genetics in polled bulls improved and there was proof that good traits like milk production weren't being lost. How many dog owners will demand certain breeds not have their ears clipped or tails bobbed for aesthetics? Dehorning cattle is not a fun job when they are few months old. Using caustic paste on dairy calves is much less disruptive and easy as dairy calves are taken immediately from their mothers. Dehorning cattle is never fun for anyone involved. I guess it's better to leave the horns on so the cows can fight and injure each other. LOL Farm boys soon learned respect and to not get between cow and calf. Dairy cows have calves year round and may need help. The Dirty Jobs show filmed the pulling of a calf. I have had to reach in and rearrange a calf before the calf could be pulled. 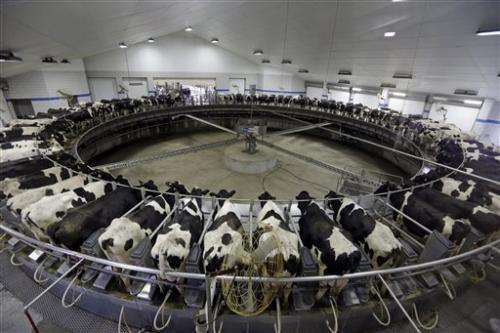 Dairy cows are genetically manipulated with artificial breeding to produce high quality and quantity of milk over their lifetime. There are only a few cattle breeds that don't have horns and if they are dairy cattle, I'm not aware of them. We used to alternate a Holstein bull with a black or red Angus to breed heifers. Angus have small heads and no horns. Holstein/Angus cross are good for beef, not milk. 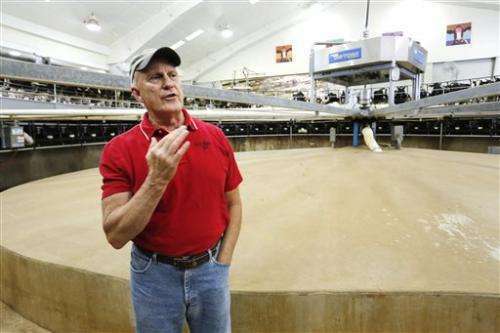 Dairy farmers will be eager to breed polled heifers if they can as it lowers their cost. My wife and I thought of raising some chickens but thought better of it. Soon we would be naming them and then bringing them to the vet if they looked a little sick and finally mourning their loss. In short they would soon become pets and not food. It's a tough life being a farmer and there is not a lot of profit in it so I can see were every dollar counts. So it's ok to cut the tails off of dogs and bob their ears for aesthetics, or declaw or neuter, IF they are taken to a vet and put under a risky anesthetic? Or, even worse, create breeds, like bulldogs, that require a vet to be born or a breed with know genetic defects? This is truly animal abuse. I don't have a problem with neutering animals or the risk of anesthesia. The other stuff does raise questions.